Sometimes craft room storage comes from the most unlikely of sources. When you want to organize but also don’t want to spend a fortune, it becomes necessary to think outside of the box. Or, in this case, inside a cardboard six pack container! 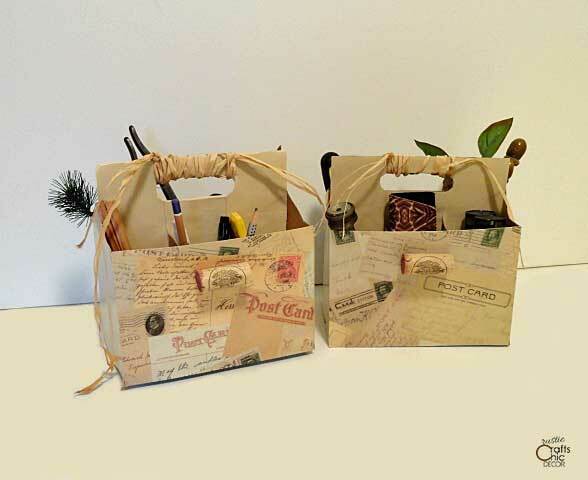 I have designed several different craft room caddies simply by recycling those six pack containers. See how to make your own DIY caddy for just pennies. Because a soda or beer six pack container is already divided up into sections, it naturally makes using one for organizing easy. I love to use them for storing paintbrushes, pens, and other light crafting tools. It’s easy to create the caddies with several different looks depending on what you use to finish them. I have decorated them with fabric, burlap, and decorated paper for a variety of looks. To start with a good base, paint the entire six pack container in your desired color. If the color will show through a fabric like lace or burlap, make sure the paint color coordinates. You can either paint the container a solid color or give it a distressed paint treatment. You can skip this step if you just want to use paint to decorate your caddy. However, to add a little more style, pick a fabric or paper to wrap around the base of the caddy. I usually leave the handle simple painted to keep it easy. Just cut your paper or fabric to fit around the base in one length. Then, apply tacky glue to the base of the caddy and wrap your material around. Keep the seam at the back. Decorate your caddy further by hot gluing on some embellishments. 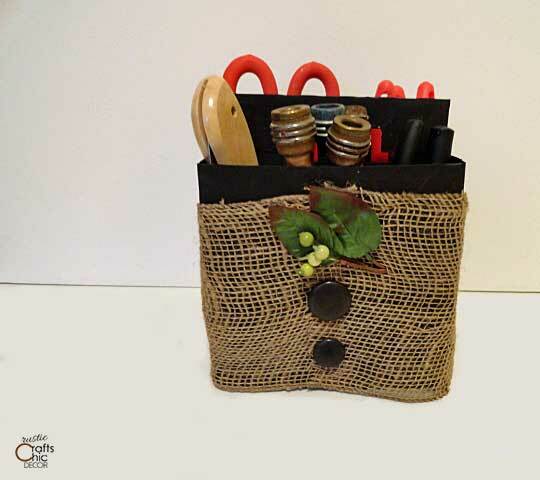 Use things like buttons, wine corks, floral picks, or even a small wreath. Here are a few of the caddies that I have made to use for inspiration. You can see that the look of the caddy can change a lot depending on what you use to decorate with. Since I have quite a stash of scrap fabric and little embellishments, I just used things that I already had in my craft room. My favorite caddy fits my craft room perfectly. The style is very rustic chic with the rustic paint technique, white lace, and rustic wreath. I painted the caddy, first, to resemble birch bark. By brushing on various shades of creams and whites, I got the coloring of birch bark. Then, I added in little gray lines that are also seen in real birch bark. Because I used lace at the base of the caddy, I first painted that part with pure white paint. The little wreath was the finishing touch for the look I was going for. With this next caddy, I went with something a little more dark and rustic. I painted the entire caddy a solid brown. Since the burlap is such a loose weave, I wanted the darker color to show through. Then to coordinate the whole thing, I added a couple of brown buttons. The leafy floral pick gave it just a little bit of natural color. I used some fun paper for these last two. When I chose the paint color, I simply picked a dominant and coordinating color from the paper. Since, I have so many wine corks, I figured they would coordinate well for an embellishment. To add just a little more texture and interest, I wrapped the handles with raffia. 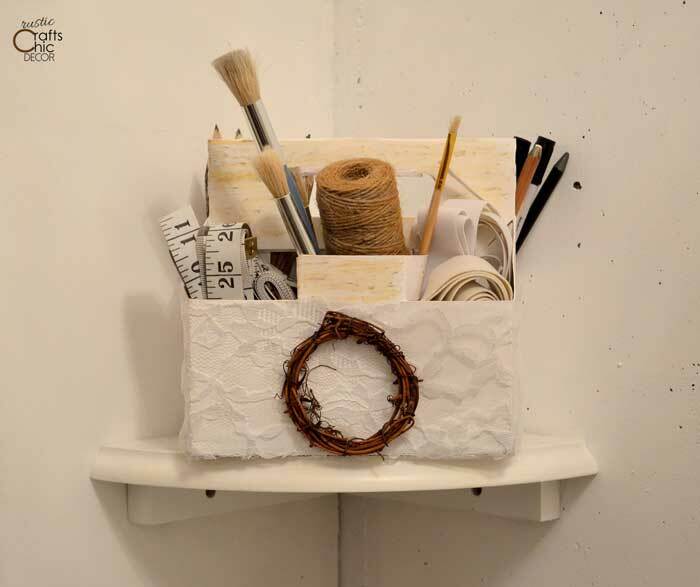 For another creative craft room storage idea, see how I recycled tin cans. I love the little caddy’s, they are adorable. I think that they would make great gift containers to. I am sharing a short post of your six pack caddy on my blog. Have a wonderful day. And Thank you for the wonderful tutorial. That’s great Linda! I look forward to reading it. I agree that these would work well for gift containers! Do you decorate th interior including the dividers? I have been playing with the same idea but I want the dividers to be solid no holes. I also want to/do put paper inside but the dividers make it hard get it to look nice inside. I have taken one apart and decorated it. I have taken out the dividers and decorated those and put them in. Didn’t look nice. Next idea is to make a small box and put it in the middle and place a sheet of paper inside where the handle is. I also want the entire bottom closed so nothing falls it. Been playing with different ideas there to.